In my last post covering Tools for Math Games I promised you another easy and fun math game you can do at home. Plus, Kiddo adores this game and wants to play it all the time. For this one we use poker chips, but you could easily substitute a quantity of buttons, beads, blocks, etc. Even New Kid gets in on the action with this game. Even though he doesn’t understand the entire game, if you can count to 5, you can play. Goal: to be the first player to reach 125 points. Poker Chips: greens are 1 point, reds are 5 points, blacks are 25 points, whites are 125. 1. Each play divides a piece of paper into three columns, labeled “green”, “red”, “black. 2. The first player rolls the dice, adds the numbers on each die and takes the corresponding poker chips. For example, if you roll a 3 and a 4 you would take 7 points in poker chips: 2 greens and 1 red and place them in the corresponding columns on your paper. 3. Play continues with the second player, etc. 4. When you have five of any color poker chip you trade them in for a chip of the next highest color. For example, if you have 5 greens you trade up for 1 red, once you have 5 reds you trade it in for 1 black. 5. The first player to obtain a white chip, worth 125 points wins. Last time I shared an easy and fun math game (make ten) with you, the gals over at waddlee-ah-chaa posted a great variation. If anyone has any variations of Fives and Tens, let us know! 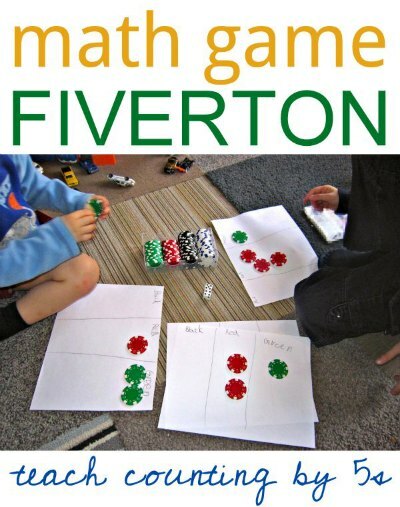 Want more math games to do at home? Visit our archives! awesome math game!! Thanks for linking uop with kids co-op! This is a great idea – and I even have poker chips – yay! Thanks for the idea! Nice game even though it would make somewhat more sense to me to use different colors for 1s, 10s and 100s. I hope all is well with you. I've been MIA for a while due to travel and crazy workload. Wxcept the trade-in is based on groups of 5. 10s and 100s are not based on groups of 5 1s or 5 5s, so you'd have to change the dynamic of the game's number system to groups of 10. So I guess it is a little weird that the game is called 5s and 10s instead of just “5s”!! I used to play “24” when I was a kid. Similar concept, but you make 24 and you can add, substract, multiply or divide. Lay down 4 (or 5 I can’t remember) cards. Everyone races on who can make 24 first. It’s a fast pace game.